This space is the epitome of a casual, yet elegant, kitchen breakfast nook. It's relaxed and practical enough for daily family meals and after school homework, but elegant enough to give off a very luxurious vibe for these neutral loving homeowners. So, whats the magic in this design? I think it's the simplicity; natural light pours through the gorgeous custom roman shades during the day and this stunning chandelier can be dimmed to the perfect "wine-sipping" setting in the evening, all while providing a place for family and friends to gather in the heart of the home. Above all, my client KNEW she wanted a neutral kitchen area, so thats what we did! She's a lover of "all things cream and gold" so coming up with the palette was quite easy. We actually started withe light fixture and used that as our jumping off point, which was key to keeping the design cohesive. Originally, we had a different "dream chandelier" sourced for this design, but it was quite over budget. I knew we could do better, so I dug deep and found this mother-of-pearl beauty, which was actually even more beautiful than the original! SCORE! Being flexible as a client and resourceful as a designer really is a winning combination - trust my process and I will never do you wrong! Because I knew this would be a very colorless space, we had to mix in a variety of textures to keep it interesting and beautiful. The custom window treatments played into the light fixture perfectly, being a sister (not twin) to the pattern in the fabric. This very intentional combination made these two features play very nicely together. This is one of my favorite sayings because I TRULY believe if its not practical, who cares if its pretty!? I design spaces and homes where real life meets design and, to me, what that means is that you can live your regular life in my designs and they will stand the test of kid and pet mess time. This space is practical for the daily life of the family who lives here. It can be eaten on, colored on, sat at and spilled on. Wine is poured, homework is done, conversations are had and meals are served all in this ONE spot. It has duel purposes and therefore MUST preform, so we kept things simple so life could happen. The chair cushions can be wiped down or even washed and the tray of decor is easily removed when necessary. Since it had to be practical to be pretty, we intentionally designed it that way to best serve this family's needs. Who doesn't want the best of both of these worlds? 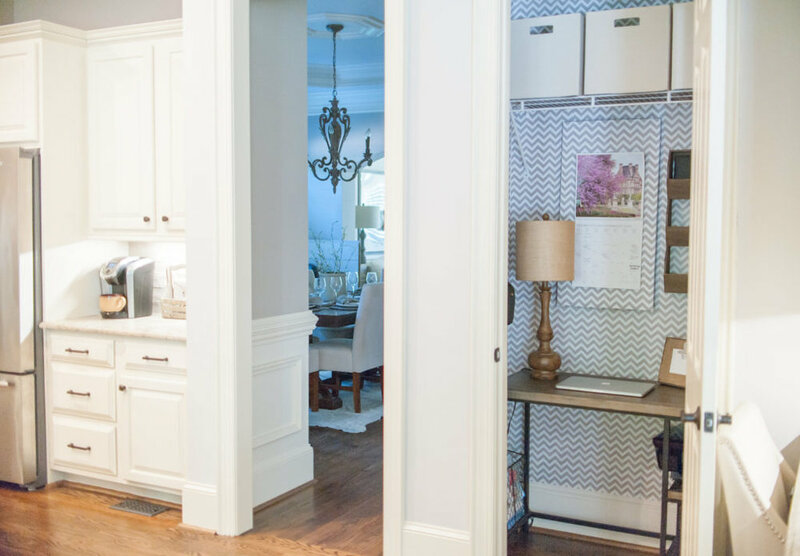 All of these little design elements come together to make the perfect space for this family. It's not an accident that it happened this way. Be intentional with how you invest your money in your home. Make those dollars count and create beautiful spaces that you can enjoy today and everyday. Don't feel like you can do it alone? No worries, contact me and we'll get to work creating gorgeous spaces in YOUR home! This is really happening, I'm revealing the Rustic Elegant Entryway AND explaining why it works!! What makes it so perfect (besides the fact that it's gorgeous)? My clients love it AND it sets the tone for the rest of their home (which we plan on doing one room at a time - how fun, right!?). Entryways have to be perfect, I mean, it is the first place your guests see when they visit - so make sure your entryway tells your story, welcomes your guests and has a strong sense of your style all in one beautiful and practical space. Designing this space I knew I wanted to use some symmetry, so I used the lamps and frames to anchor the design in a very balanced way which allowed for a very calm feel. I also wanted to add a mix of old and new elements to create visual interest and a sense of depth, so I created little vignettes on the entryway table in various heights and textures. For any space to work scale is top priority. A lot of clients reach out to me saying, "Something's off, something just isn't right and I cannot figure it out", and most of the time it's the scale or balance. Most people buy their wall art too small (ugh, it kills me! ), so I added the large round mirror to keep the proportions right. This foyer has high ceilings and I needed a large piece to make a statement, not only did the mirror accomplish that, but it also made the space feel even bigger! Because the of high ceilings and amazing amount of natural light, I also needed to add warm elements to make the space welcoming. The rug, which is amazingly soft, and pillows added those cozy elements this space needed. Now the fun part, the finishing touches! Most people think once the big pieces are purchased the space is complete, but that's not the case - that's just furniture and walls! BORING! It’s the little details, or the "Design Elements" that give the space personality and character! Examples of these elements in this design include the gorgeous bird cage on the amazing, antique open book! Creating layers like this makes the design feel purposeful and interesting. Also, the wood frame with the handwritten "Welcome" sign and the mercury glass vases bring in new textures that really make this space special and memorable! I take pride in creating timeless and curated spaces that represent my clients. Now, let me represent you and give your home timeless beauty sprinkled with your story! Email me to schedule your 30 minute phone consultation with me and if we're a good fit, we'll get you on the schedule! I'm looking forward to hearing from you and sharing more of my timeless creations, one design at a time! Yes! 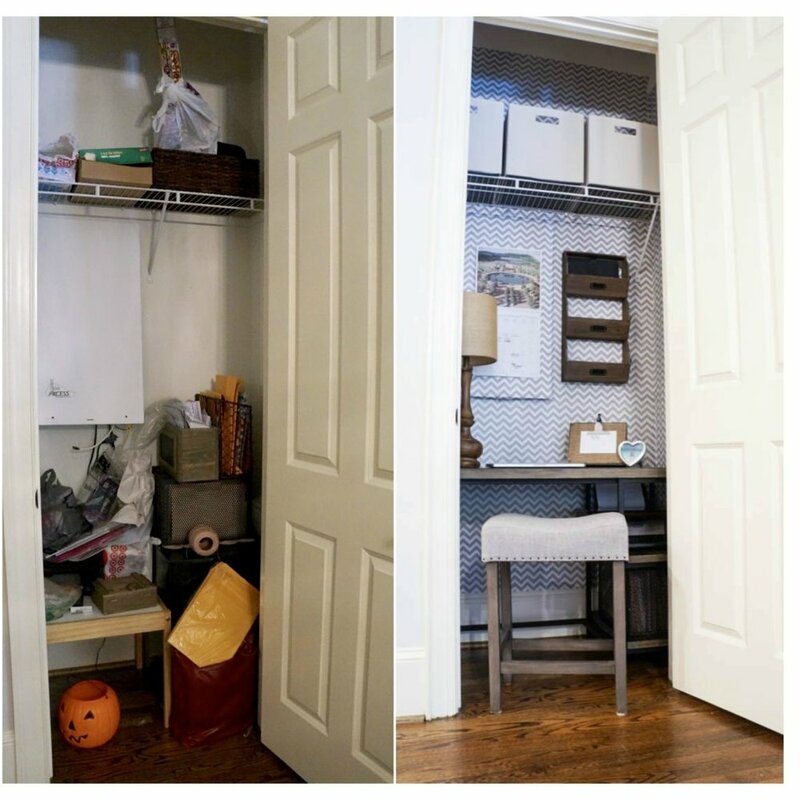 I turned a closet into an office space! I created a "Cloffice"! Why on Earth did I do something like this? Well, probably just like many of you, I had that ONE closet that was just a catch all. It was useless because I had so much stuff THROWN in there in an unorganized way (see BEFORE picture below), that even when I knew where it was, it was impossible for me to get to it without things crashing down on me followed by a 30 minute loading/unloading session. NOT. COOL. AT. ALL. I was fed up, got creative and now it's super functional and quite adorable! One of the real reasons I decided to do this was that my husband is a bit of a "leave things on the counter" kind of guy and I would always end up putting things "away" for him and they would get lost. He didn't really have an office space to keep his things where the kids (or I) would not touch them, so this is where the "closet office" idea came from. This particular closet was in our kitchen (see below), so it was the perfect place to store his work belongings and still have them accessible as he is running out the door. I'll break down my steps to doing this so that you can create something similar yourself if you'd like. 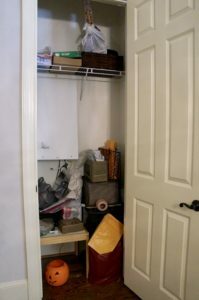 I first took the dimensions of my closet (length, width, height), keeping in mind the trim insets; make sure you get the smallest measurements inside the closet space. I searched extensively online for a "Narrow Desk" that would fit my dimensions. I happened to find this one on Overstock for a great price. I LOVE that it had the open shelving that I could set my printer and other files on. While I waited for the desk to come in the mail, I emptied out the closet. YIKES! My entire kitchen was a mess and things got way worse before they got better, but it was worth it! To organize, I went to Target and grabbed some of these bins that I LOVE! I've used them in about every room of the house and they're perfect for organization, but also keeping things neutral. I organized my items in the closet into 3 categories (light bulbs, cords, and kid stuff) and placed things in the bins to put on the top shelf I already had in the closet. I cut out a small section of the Contact Paper I had left over and adhered it to the wall to test it out. Guess what? It stuck! So I ran over to Target again and grabbed me three additional rolls and got to work. Friendly Tip: When your trimming your corner edges, use a box cutter, it makes a very clean and straight cut. By the time I finished my contact-paper wallpaper job, I had received my desk in the mail so I started to work on that. The worst part about it was that I had to assemble the desk INSIDE the closet, otherwise I could never get it in (hope that makes sense). My husband was not home (and I'm incredibly impatient) so I did it myself and it WAS possible, however I would recommend it being a two-person job! Lastly, I hung some functional wall decor to store our bills and hang backpacks and whatnot, just to keep things off the desk and use the vertical wall space as much as possible. We stored our printer and files on the two shelves in the desk and that was it! When I stepped away, I could not believe my eyes and the transformation! So, What do you think? HUGE difference, right? It's adorable, practical, useful, purposeful design that actually WORKS for our family. Instead of praying nobody ever opens that closet door, I now show it off when friends and family come over...who would have thought a closet could be so fun!? Are you inspired? I hope so! SHOW ME! I want to see those ideas and projects! Take before AND after photos and use the hashtag #SLBInspo or email me with pictures, questions, or ideas - I'd love to hear from you! 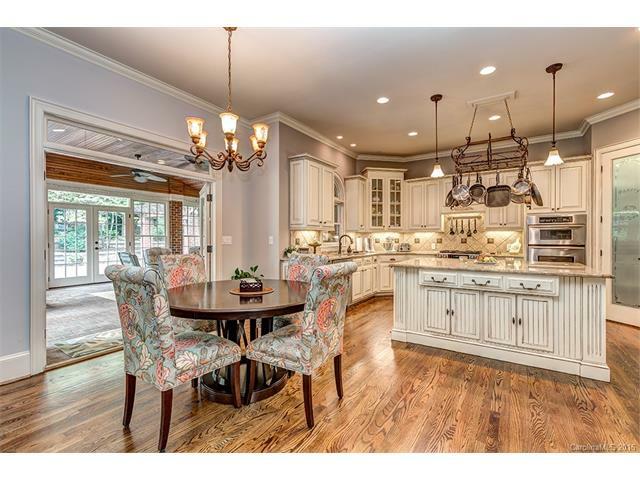 I dreamed of this kitchen makeover since the very first time I saw this house. I remember flicking through the listing online thinking "Wow, this could be "THE HOUSE" for us, it's perfect in so many ways...BUT that kitchen...". 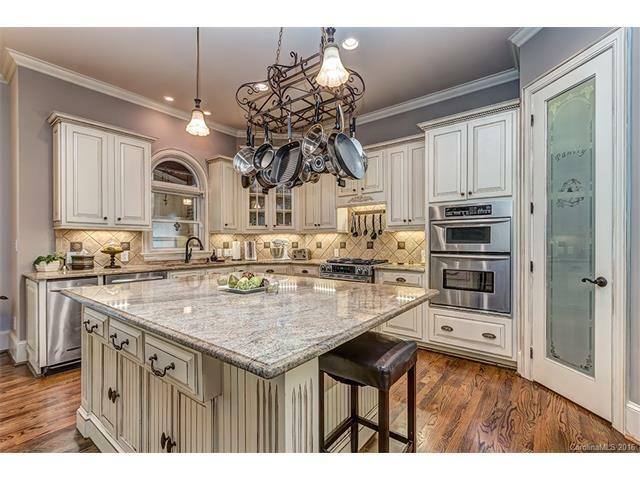 The kitchen, on the surface level, just didn't seem to fit with the rest of the house, it seemed to still be living back in the early 2000's with that "tuscan" vibe with the glazed cabinets, ornate light fixtures, and that backsplash! But even back before we owned it, I had a vision for this house and what it could become one day; I prayed that someday it would be ours and that I would get the opportunity to make it over. Well, it happened and we've been here for almost a year now and I am so proud to say that I was able to make my vision come true thanks to the humungous support from my husband, who (not so voluntarily) agreed to let me do it! So, let's get to it! I'll start with a few "Before" photos. Then I'll show you some "After" and then in a separate, probably quite lengthy post, I'll explain my "process". I'm doing a separate post for the "process" because it was quite a long one and I want you to see each stage of the makeover in it's entirety so that if you are considering doing something similar, you can follow the same steps, if you'd like. I'll even tell you about the pretty descent size mistake I made with the backsplash (many of you probably remember this dilemma if you were with me on Instagram and Facebook back then) and how I recovered from it. So, you can see it was good before; I could never have based our decision to buy the home on the condition of the kitchen. Functionally, it's perfect for us. Before we moved in the previous owners converted the two tier island to a huge flat one and overall, it's a HUGE kitchen. I felt that it just needed a makeover and some restyling to make it cohesive with the rest of the house and continue to tell our story. We did A LOT (painted island, painted cabinets, new hardware on cabinets, added faux hood vent, new light fixtures, new refrigerator, new backsplash, moved electrical, updated electrical faceplates), but I was able to take our money a LONG WAY because I was resourceful and adamant on not spending an arm and a leg. Okay, Are you ready? Now for the after!!! So, what do you think!? Do you love it? I do! Please share your thoughts below in a comment or if you have any questions, I'd love to hear them and try to answer them. As I progress on the blog side of things, I'll write posts specifically catered to each of the 5 elements, so I can really break them down for you, but for now we are focusing on the big picture, which is Transitional style. I've also written my "Design Bible", which is really more like a seminar, that gives you a thorough breakdown of each element. If you're serious at learning how to conquer this style of design, I'd start there. The big idea (and beauty) of Transitional style is that it's not boring. Even though it's neutral, it still has personality, character and even color! Even though it's practical, it's still beautiful because of how seamlessly everything flows together. And, most of all, even though you and your spouse (or roommate/partner/etc.) may have different tastes, these tastes and styles can be curated (or collected) in a way that absolutely works! Actually, all the layering and elements that go into Transitional design, make it feel very high-end and very "designer". And, best of all, these designs will stand the test of time and won't feel dated in a few years, giving you more bang for your buck (and efforts)! The ONLY downside is that it does take some planning to execute a complete design that works perfectly, sometimes you have to do things in phases to make sure you stay on track. That's not to say that you can't DIY Transitional spaces, you will just need to plan ahead because there is a FINE LINE between a thoughtfully mixed space and downright chaos! You don't want your space to feel like you just took all of your favorite things and randomly scattered them around your house, it won't feel right, there is an art to doing it properly, and that's where I come in! I will help you create an edited spaced that feels purposeful and looks beautiful. If you need help on something specific or have questions along the way, go ahead and contact me and I can elaborate and write a post about that concept or we can look at some Interior Styling packages that might fit your needs. I'm so looking forward to taking this design journey with all of you and sharing with you my design methods so that you too can live in a space that looks and functions beautifully with your every day life! Home decor can be an art that can make us feel confused, stuck or frustrated! But, there is a very simple and easy way to come up with a balanced color palette for your space. It's the 60-30-10 Rule! It's a classic decor rule that helps create a color palette for a space. It states that 60% of the room should be a dominant color, 30% should be the secondary color or texture and the last 10% should be an accent. How to Use the 60-30-10 Rule? The 60% is the overall color of the room, the background color if you will. When you look at the space you'll say, it's the "gray" room, or whatever color you choose. The next number in this rule is your 30%. It will become the secondary color in your space and will support the main color, but be different enough to give the room interest. Think of it this way, you'll be using half as much of this color as you did for your main color. The fun percentage is your 10%; your accent color. It can be more bold or more subtle depending on what look you want. The 10% can be what gives the room character or keeps it that much more neutral, it's really up to you. If you haven't yet read my post on the 5 Secret Elements to Interior Design; a complete guide on how to get the space you love using the things you love, then you should go do this now. Once you've read this, you'll understand how to create balance while mixing styles/tones/textures. As you know, I recommend a neutral color palate that allows you to create a practical and curated space using pieces you love, but you can chose any colors you like using the 60-30-10 rule. *A big thanks to The Spruce for providing some great examples for this 60-30-10 Rule. Choose only ONE color and use lighter and darker variations of that color in your space. 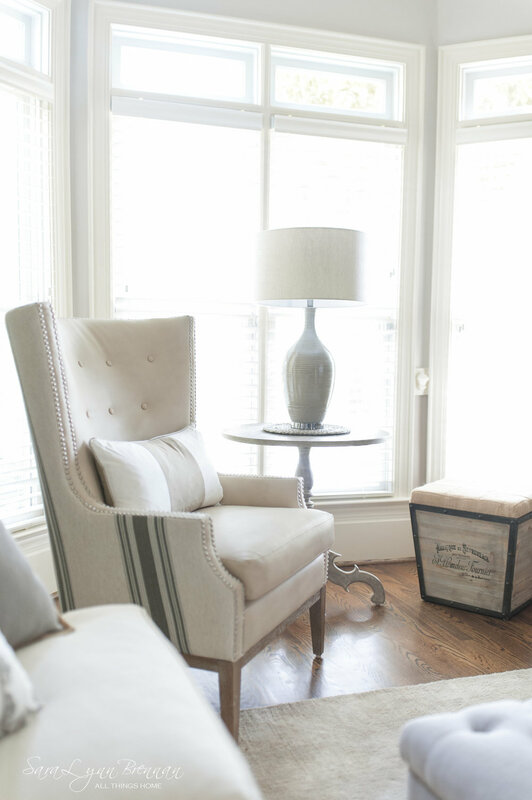 This works best with a neutral color such as gray, cream, white, or greige. Select TWO colors opposite from each other on the color wheel. One will always end up being a "warm" color and the other will be a "cool" color giving you a nice balance. Select THREE colors adjacent (next) to each other on the color wheel, having the middle color being the more dominant color. An example of this would be blue-green, green, and green-yellow; do you see how green is showing up in all three? Ahh, yes! Similar to Complimentary (listed above) but you add in a third color. So you select a main color, find it's complimentary color across from it on the color wheel, and add in one of the colors adjacent (next) to the complimentary color. An example might be, Blue as your dominant color, then orange as your complimentary color and red as the third color. *For more information on the color wheel, head over the The Spruce to learn more. Can I Break the 60-30-10 Rule? Add a fourth color to the mix by doing something like 60-30-10-10. This will be done by adding a second accent color in your accessories such as throw pillows, vases on shelves, picture frames, etc. Select ONE color and go wild and crazy from there by including several darker and lighter shades of that same color throughout your space. This can be done with wood tones as well. You may end up with an entirely gray room, but it will have dimension because of the variation of tones you use. I always talk about Interior Styling and Home Decor being about how the space makes you feel. If you are feeling like you have an idea for colors, go with it! It may end up being something like 40-30-20-10 or 40-25-15-10-10 or even 75-15-10. Whatever the case, just make sure you hone in on your percentages, otherwise it may look wild and crazy! Okay, that's it! I know it may be confusing, but re-read this a few times, jot down some ideas and you'll be on your way in no time! It is a very linear way to think about design, which sometimes can be so abstract. Just really stay on track and try to follow your percentages and you can't go wrong! Finally figure it out? Or need help? Please share your progress or questions with me by contacting me on my website or on Instagram. Can't wait to hear from you! Join below for regular design inspo, tips, and sneak peaks at my latest projects. By joining, you agree to receive my marketing emails. Thank you! We can’t wait to enthrall you with design and style.